Disclosure: I received these lanyards complimentary but all thoughts and opinions are my own. When going on a Disney Cruise, having your Key to the World Card (this is your card to get into your stateroom and to make purchases) on a lanyard is essential! Having it around your neck makes it easy to have out at all times, since it is used so frequently. If you’ve never been on a Disney Cruise before, you will need to bring your own lanyard (or you can purchase in a shop on the ship). If you’ve sailed before, you will receive a silver or gold Castaway Club lanyard upon check-in. 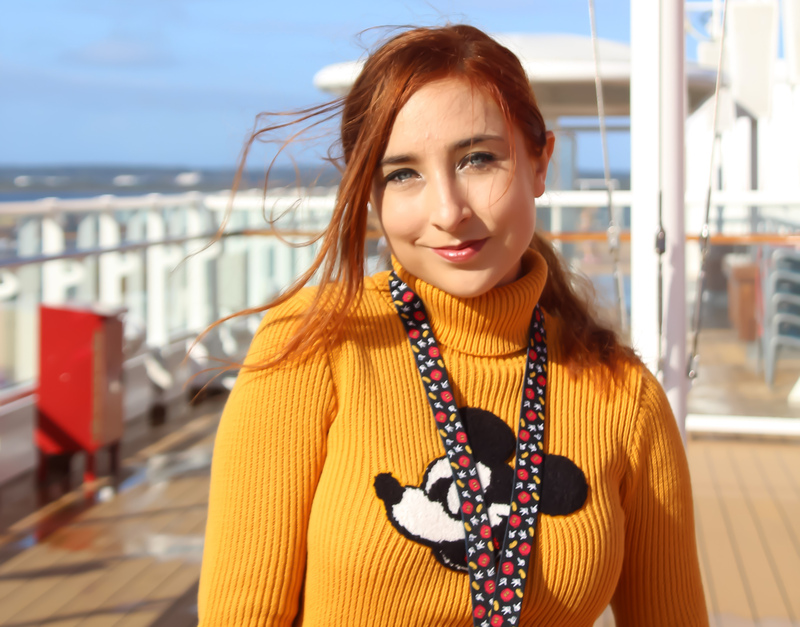 Having the complimentary lanyard is nice, but on my most recent cruise I thought it would be fun to coordinate my lanyards with my outfit for the day, to add a bit more flair and style to my Disney Cruise! For night one, we were eating at Triton’s, an art deco-style Little Mermaid themed restaurant. I packed this Ariel-inspired Buckle-Down lanyard, to pair with my Danielle Nicole Kiss the Girl purse! For day 2, we were in Astoria, Oregon. It was a little chilly, so I wore my vintage-style Forever 21 Mickey turtleneck sweater, which I paired with a classic Mickey Buckle-Down lanyard. It’s one of my favorites! A black lanyard with his shorts, shoes and glove icons on it! For the next day, I sported a casual Disney Cruise Spirit Jersey look, which I paired with a Buckle-Down lanyard featuring Minnie Mouse in her classic blue dress! That evening, it was pirate night! (One of my favorite nights on a Disney Cruise vacation!) I found the perfect lanyard while browsing Buckle-Down’s site…Captain Hook! I placed some Disney pirate pins and paired it with the cruise bandana. For my final lanyard of the trip, I wore an Olaf lanyard, paired with a matching Buckle-Down Olaf cinch belt since we were going to be seeing the Frozen show on Disney Wonder! I loved that all the lanyards were comfy (not scratchy around my neck at all) and had some stretch to them. Plus I received so many compliments on my Disney Cruise lanyard style from fellow cruisers!